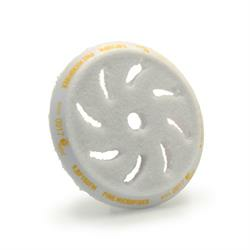 Microfibre polishing pads are ideal for restoring gloss and clarity to paintwork. These pads have been constructed using a RUPES designed and patented manufacturing process. A polyurethane resin is injected between the velcro interface and microfibre material to provide a superior bond, moulding the two sections together for unbeatable durability. The bevelled edge protects from accidental contact between the backing plate and the paintwork and allows the user to machine polish into tight corners. The 150mm pad easily removes swirls and holograms to deliver a high gloss shine.